The AMA is actively working in conjunction with Association of American Medical Colleges to inculcate young physicians with the ethics of "social justice." Since 2005, the "Initiative to Transform Medical Education" has been working to correct what it views as deficiencies in the current training of physicians. These include an over-emphasis on the ability to acquire knowledge and problem solve-- to the detriment of "caring." Traditionally, physicians have expected to be autonomous decision-makers--but according to the Initiative this clashes with "increasing requirements...to be more accountable to various constituencies, including...the public, payers and government." Although physicians are recognized as "prepared to do what they believe is best for individual patients... [t]hey are not...prepared to participate in ethical and political discussions about the allocation of health care resources, which are not limitless." The solution proposed for allocating finite resources is John Rawls' principle of social or "distributive" justice. "Social justice" is a euphemism for economic egalitarianism--and since people do not naturally come by equal wealth, "social justice" requires taking from some to give to others. "Social justice" is thus in direct conflict with the principles of equality before the law and the individual right to private property. "Social justice" also requires that a physician NOT advise his patients solely based on what is in the patients own best interest. He must instead somehow "balance" the patient's interests with those of the rest of society. [C]onsiderations of justice must inform the physician's role as citizen and clinical decisions about resource allocation. The principle of distributive justice requires that we seek to equitably distribute the life-enhancing opportunities afforded by health care. How to accomplish this distribution is the focus of intense debate. More than ever, concerns about justice challenge the traditional role of physician as patient advocate. The ethic of medicine must seek to balance the physicians' responsibility to each patient and the professional, collective obligation to all who need medical care. Not only is this new ethic altering the curricula of medical schools to emphasize "social justice," but admission requirements will also be changed--deemphasizing a background in the sciences and MCAT scores. It is hoped that the selection of more "altruistic" and less competitively driven applicants will result in a larger number of residents opting for a less prestigious and less remunerative career in primary care. This shift away from academic excellence and autonomy in the doctor-patient relationship toward serving the needs of society follows directly from centuries of medical ethics disavowing the legitimacy of physician self-interest. This error is compounded by a claim of moral superiority because "medicine is a profession not a business." The distancing of medicine from business has done both a disservice. In claiming to be primarily an altruistic service, physicians have essentially invited the government to enforce this ideal while simultaneously denigrating the honorable occupations of production and trade. In failing to understand and defend the morality of profits, and the harmony of self-interest which characterize voluntary economic transactions, doctors have aided the enemies of freedom and capitalism-- who are now designing medical school curricula and admission requirements. Capitalism is nothing more than the individual rights of life, liberty and property as applied to trade. Profits, in medicine as in any economic transaction, are not gained by exploiting patients or customers. Profits are simply the proper reward for successfully offering a value to others which is worth more to them than it costs to produce. In a system of free trade, self-interests are not in conflict--not even between a physician and a patient. In a direct-pay, fee-for-service relationship, it is in the best long term interest of the physician to offer advice and treatment based on the patient's best interest. And, it is in the best long term interest of the patient to only deal with a physician who does! We can not defend patients' freedom without also defending the freedom of physicians. We can not protect the doctor-patient relationship without protecting the autonomy of both. 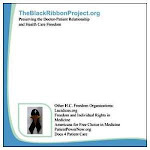 Freedom of association and freedom to contract are interrelated principles fundamental to a free republic, to capitalism and to the ethical practice of medicine. "Social justice" requires that the individual be sacrificed to the collective. Such an act is as immoral in medicine as it is anywhere else. "Social justice" claims to be what it isn't-- because true justice will never involve the violation of individual rights. The only way to assure justice and an ethical doctor-patient relationship is through the consistent, proud, principled defense of individual rights. The only way to assure justice and an ethical doctor-patient relationship is through the consistent, proud, principled defense of individual rights. In economics, that means capitalism. In medicine, that means the freedom of choice, not government mandates, for both doctors and patients. Update 5-21-10 Two other articles on the training of physician to advocate for "health care reform"--by which is meant greater government control. It is time for physicians to rise up and take action. The Association of American Physicians and Surgeons has been the "voice for the private physician" since 1943. It stands for the private relationship between patient and physician with no or minimal outside pressures. The AAPS is currently involved in a lawsuit in the DC court to overturn ObamaCare. We need to band together and make the AAPS larger than the AMA so that our clout will be felt by those who want us to think collectively instead of view our patients has individuals. Good article, Beth. I posted it on Facebook. I hope doctors - and patients - will pay attention. RE:"There is scant evidence to suggest that routinely listening to every healthy person’s lungs, or pressing on every normal person’s liver, will find a disease that wasn’t suggested by the patient’s history. For a healthy person, an “abnormal finding” on physical exam is more likely to be a false positive than a real sign of illness." This goes along with what I have read and what I was taught---but I would also agree with that touch is important--but so is listening and good eye contact. I disagree that what physicians do is not "business." We have a trade transaction which is just like all businesses--it's just that what we are selling is more personal than many other economic transactions. I think physicians do themselves a disfavor when they try to distance themselves from business--in addition to incorrectly denigrating business. The voluntary trade of value for value is a highly moral activity--whether you are offering professional advice or purchasing a good. Both kinds of transactions enhance the life of both the seller and the buyer. I will be speaking at the AAPS national meeting this September in Salt Lake City. Will you be attending? Thank you for bringing to light this corruption of the education of physician's. The idea that a doctor's rational grasp of medicine is somehow inferior to his or her "feelings" about the patient, and worse, that society has a claim on a doctor’s mind, is obscene. These ideas are a full-scale assault on reason as man's means of survival; they are literally mankind killers. What good does it do me as a patient, with a serious illness, that my doctor "feels for me"? What I need, what I'm willing to pay for, is the full force of my doctor's intelligence turned on the problem to heal me. And I need the same from myself; people forget that the patient is part of the healing process and must cooperate rationally with the doctor to get well. As for society's claims, there is no such thing. There is no "society" merely individuals who choose to live together. If I choose to save my money/get insurance in order to have the best medicine available, why is my neighbor entitled to some of my savings just because he can convert oxygen into carbon dioxide, and lives in the same country that I do? Ayn Rand once wrote, don’t bother to examine a folly; just ask yourself what does it accomplish. The idea of social justice being given prominence over rational problem-solving and understanding in medicine would destroy objective standards of healing in medicine. This will cause the best minds to flee medicine, rightly so; it may also hasten into it those without ability but a desire for the reflected, second-hand glory of being a doctor. These forces will cause the mortality and morbidity rates to rise. In Russia, the pioneer of social justice in medicine, life expectancy for men is about 59 years. Death, slow and lingering, or swift and sure, are the two main results of social justice in medicine. This is the ultimate aim of all social justice, and those advocating it.